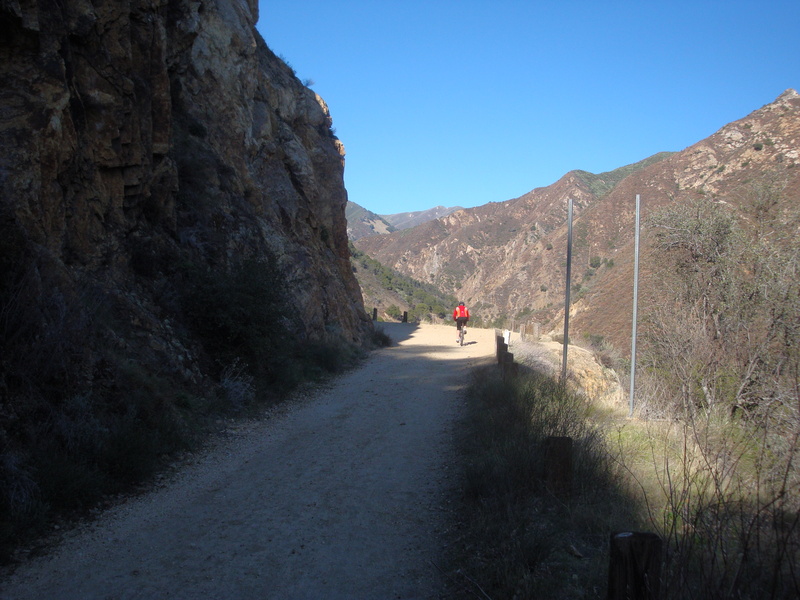 Leaving the Arroyo Seco Campground. You know it’s mid-winter when the road is still shaded at 11:00 am. But you wouldn’t know it’s winter once you turn the corner. It’s dry as August on the traverse above the gorge. Looking up the Willow Creek drainage. 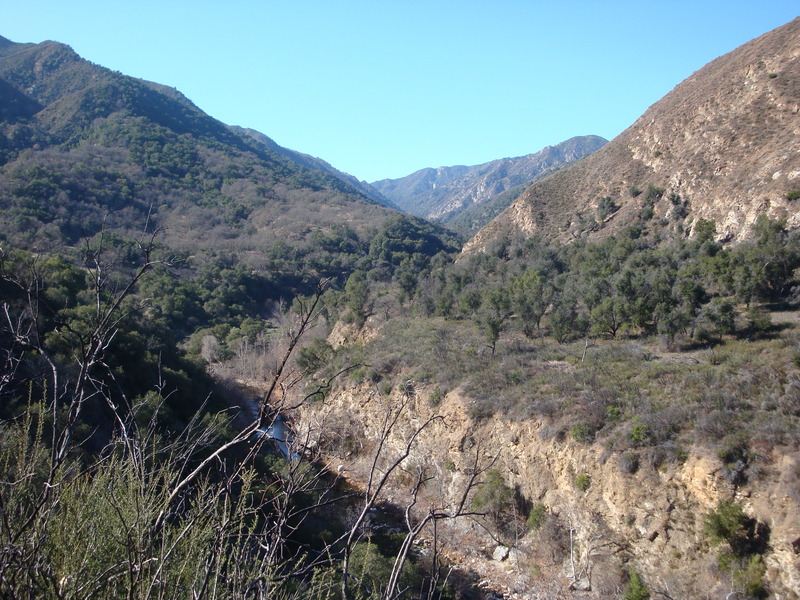 The Arroyo Seco River in the foreground. 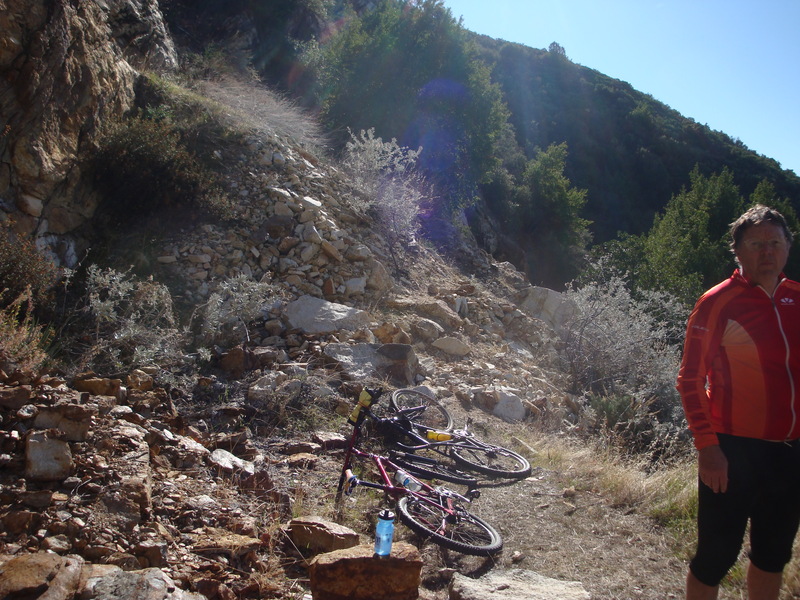 As the road climbs higher, rock piles and encroaching vegetation frequently narrow the passage to singletrack. 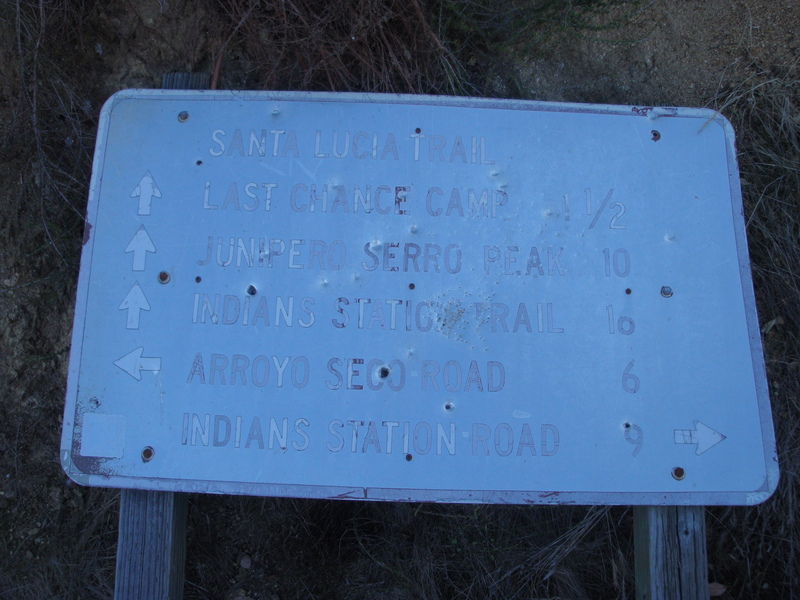 The faded sign at the junction with the spur route to the Santa Lucia Trail and Last Chance Camp looks a little tired. It now reposes directly on the ground. You’d be tired too if you’d been standing on that ridge for all those years with nothing to do for fun but misspell people’s names. At the slide. Don’t complain about having to carry your bike over this mess. If it wasn’t for the slide, the road would probably have been reopened to cars more than 10 years ago. At the edge of Hanging Valley. 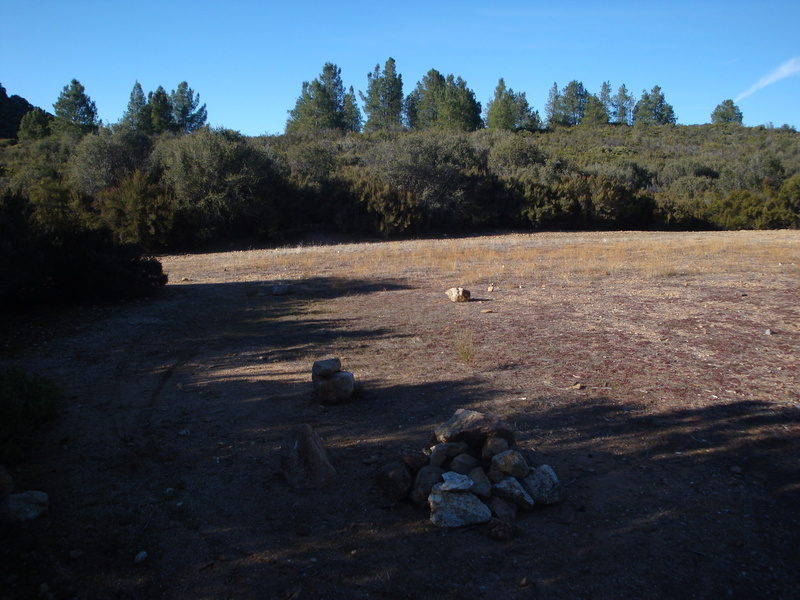 All that’s left of Hanging Valley Camp is a clearing and a fire ring. There was plenty of fresh water in the stream just below. Hanging Valley scenery. Black Cone in the left background. 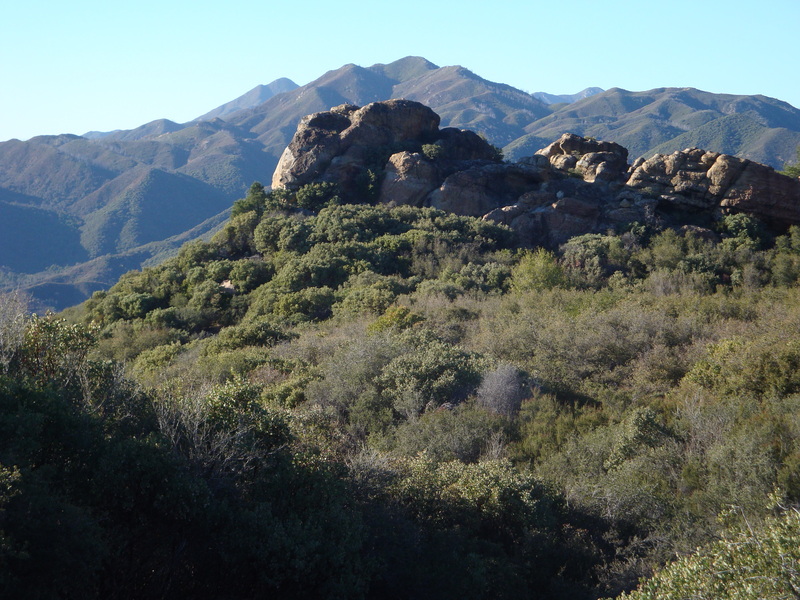 Above Escondido Camp. Look carefully (clicking through to the larger picture helps) and you can see the Lost Valley Trail switchbacking up toward the saddle. 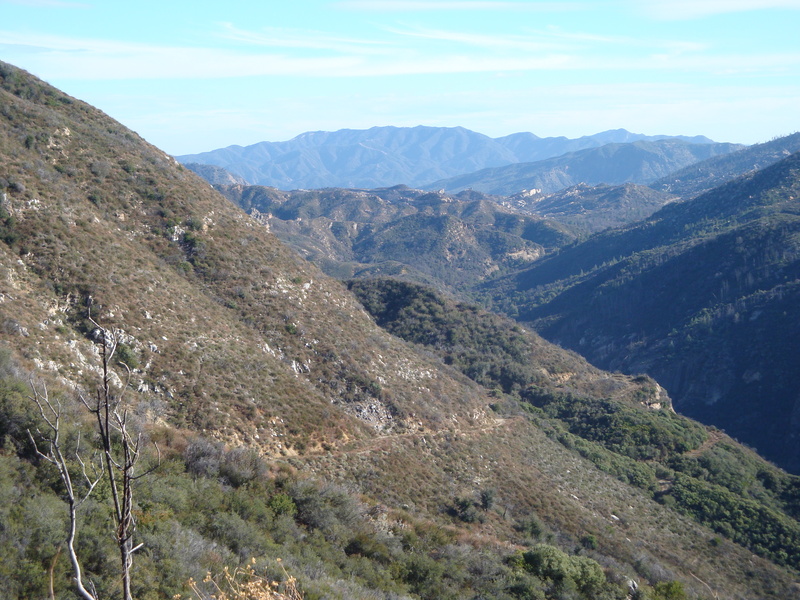 View toward the Indians from the Escondido Grade. Another one bites the dust. Never tell someone riding a bike to make it look good because you’re taking their picture. Especially when that person is an exceptionally skilled on and off-road cyclist with more than 30 years of racing, touring and even frame-building experience. 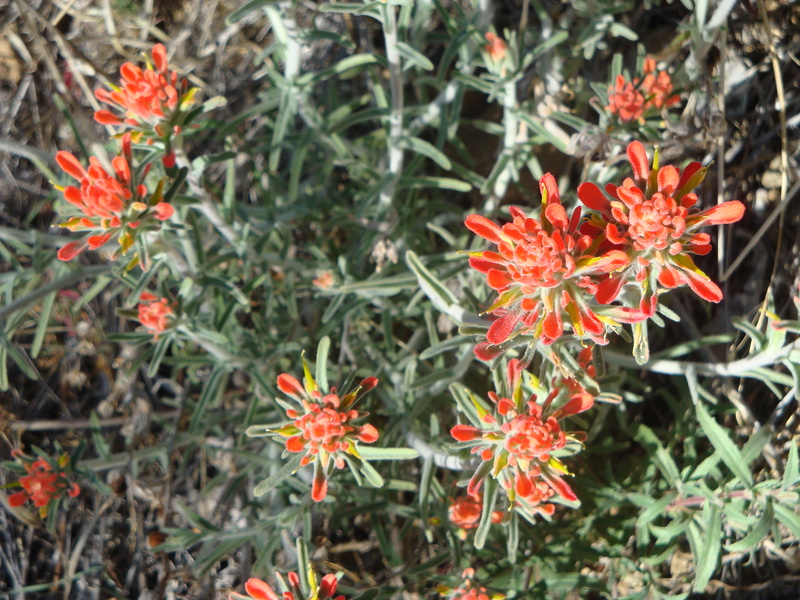 With the exception of some scraggly Goldenrod and California fuchsia still holding out from last summer near a seep, the only blooming plant we saw on the entire ride was this clump of Indian Paintbrush (Castilleja affinis?). Did we mention that it’s dry out there? Crossing the slide on the way back. 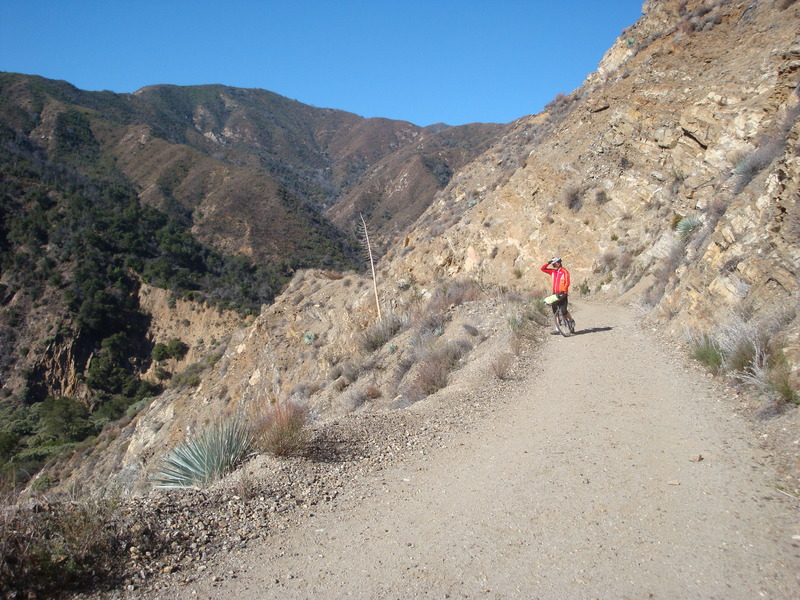 Congressman Sam Farr’s Big Sur Forest Service Unit Management Act would designate this road a National Recreational Trail, preserving it for hiking, biking, and equestrian use and ensuring that it is not reopened to motor vehicles. Just another reason to hope that legislation is enacted soon. For more reasons, click here. 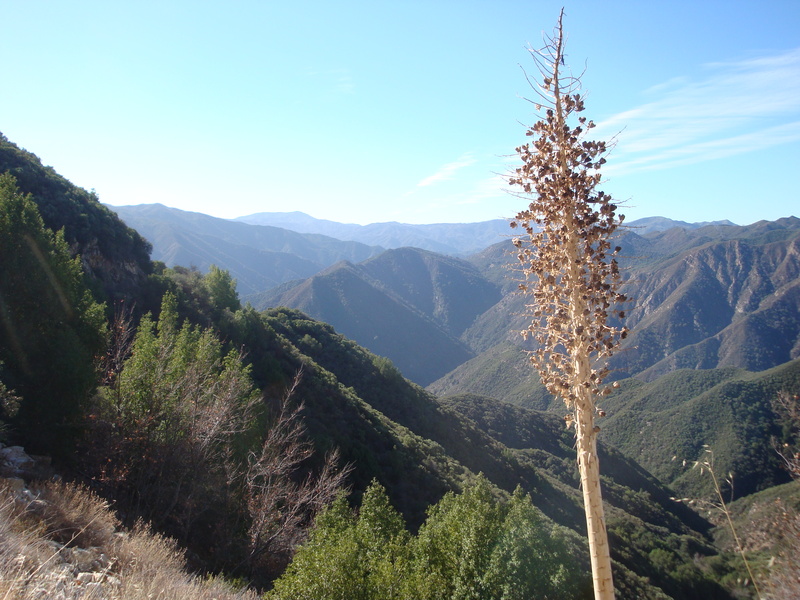 The Arroyo Seco-Indians Rd. 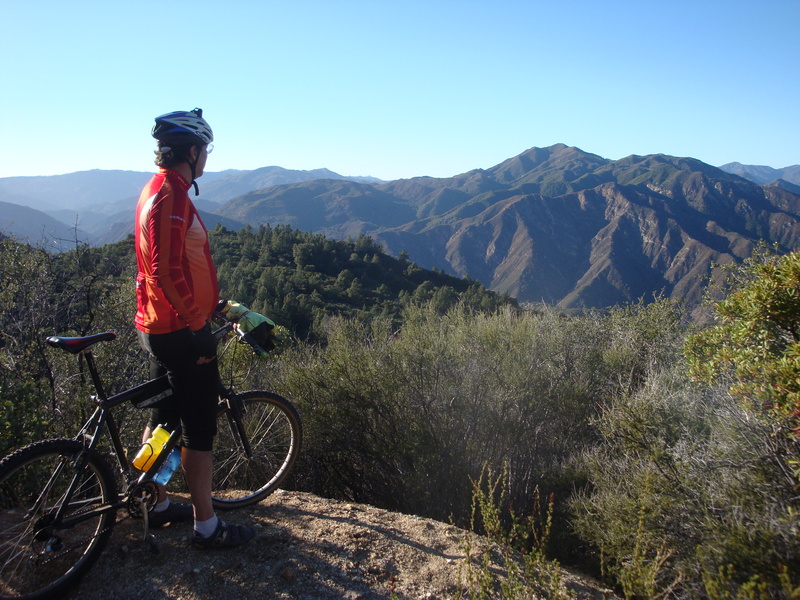 is becoming a popular route for bicycle tourists. A mountain bike is not required. 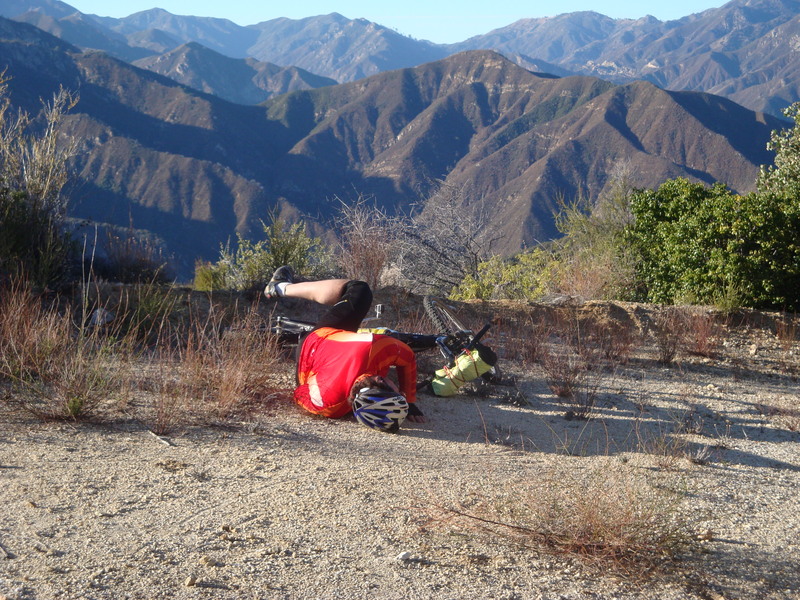 We saw a couple on loaded touring bikes today, and these people made the Arroyo Seco-Indians Rd. part of what must have been one of the greatest wildflower tours of all time. 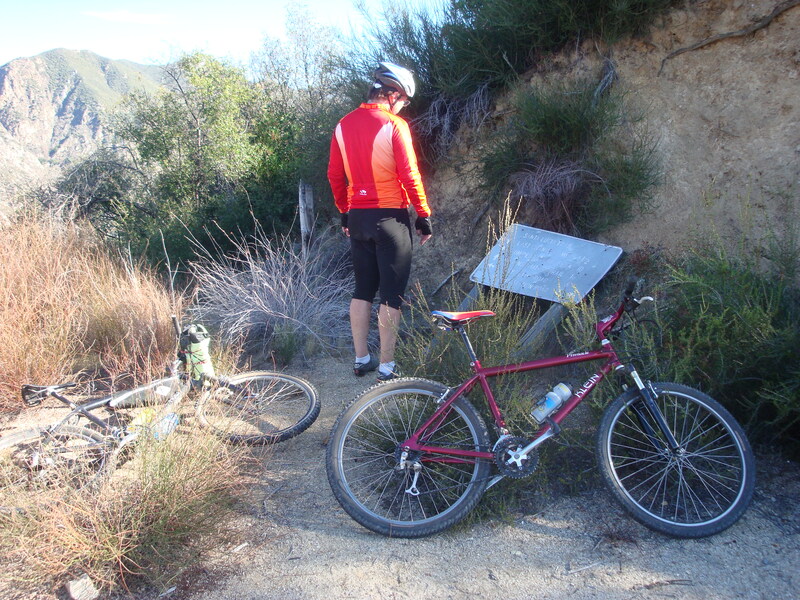 This entry was posted on Sunday, January 15th, 2012 at 10:31 pm and is filed under Cycling, Santa Lucias, Wildflowers. You can follow any responses to this entry through the RSS 2.0 feed. You can leave a response, or trackback from your own site. That looks like a fantastic bike trip a wonderful way to get around to see the amazing country side. Thanks for the great virtual ride. I hope to go on one of those with you at some point when I get back to town. Nice pics. Any chance you have an elevation profile from your ride? I’m wondering what the elevation gain would be from Arroyo Seco Day Use parking to Highway 1. We’re not much for carrying electronics with us, so no profile. 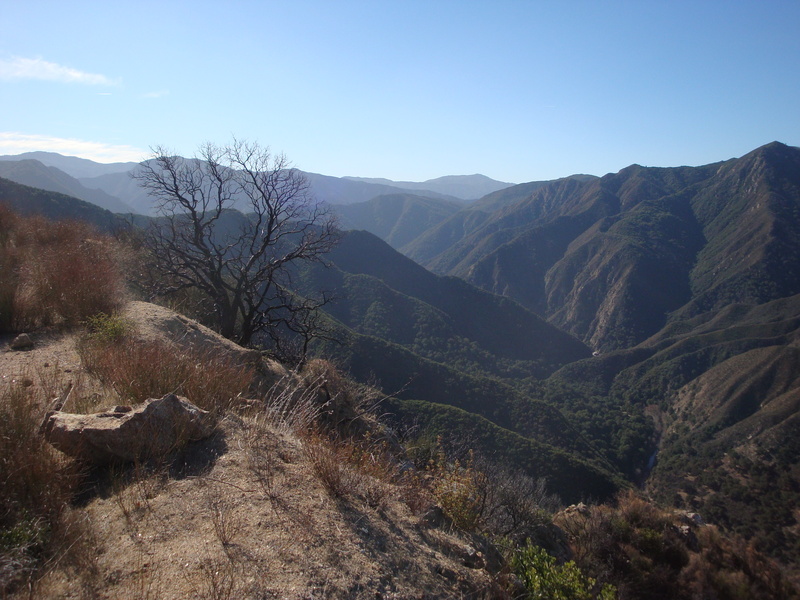 I think the major climb on the Arroyo Seco gains about 1,900 feet and the NF Road about 1,300 feet. 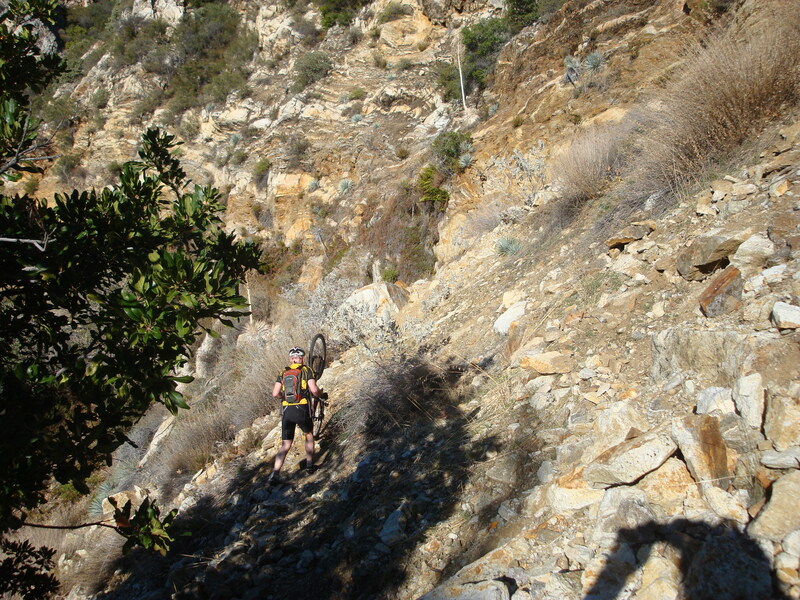 The smaller climbs probably don’t amount to much more than a thousand feet or so combined. 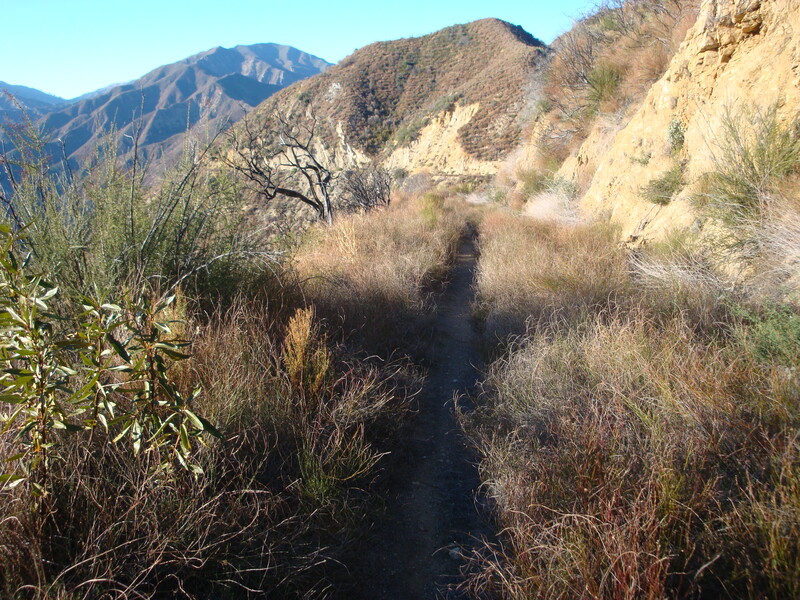 Call it 4-5,000 feet of elevation gain from Arroyo Seco to Hwy. One. Not as bad as you might think. Thanks for the info. Definitely on the list of rides I need to do. I did a short section Friday with my daughter and it was a beautiful ride. 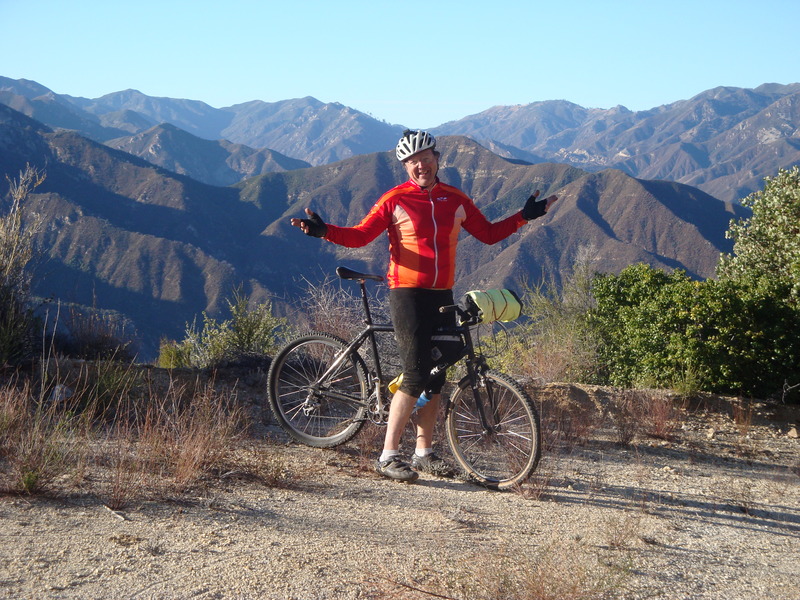 I’m contemplating riding arroyo seco with my son in a few weeks. We’ll be touring and I’ll be on a mountain bike. He’ll be on an older steel frame bike (mountain bike frame but not a true mountain bike) w/ 700 x 38 tires. A couple of questions. With the exception of some spots where the bikes need to be carried, is this a highly technical ride? 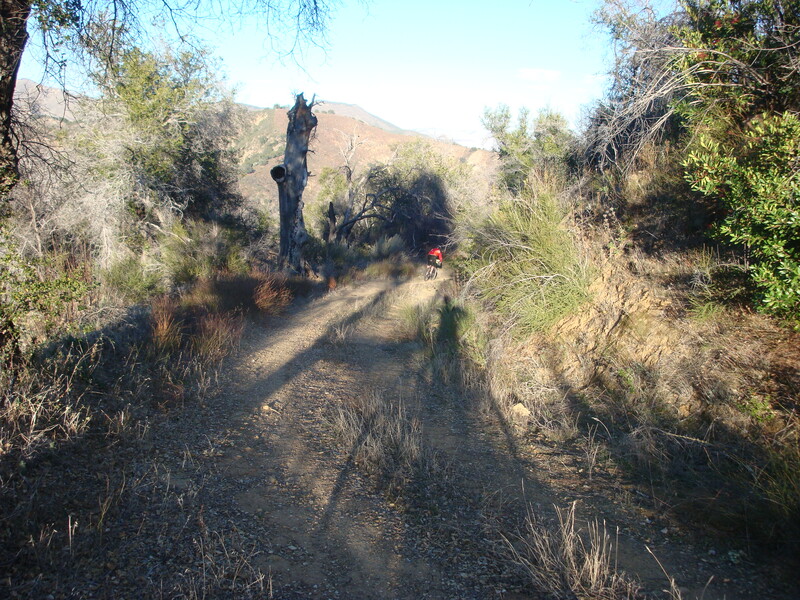 What is the distance between the Escondido and Arroyo Seco camp ground? 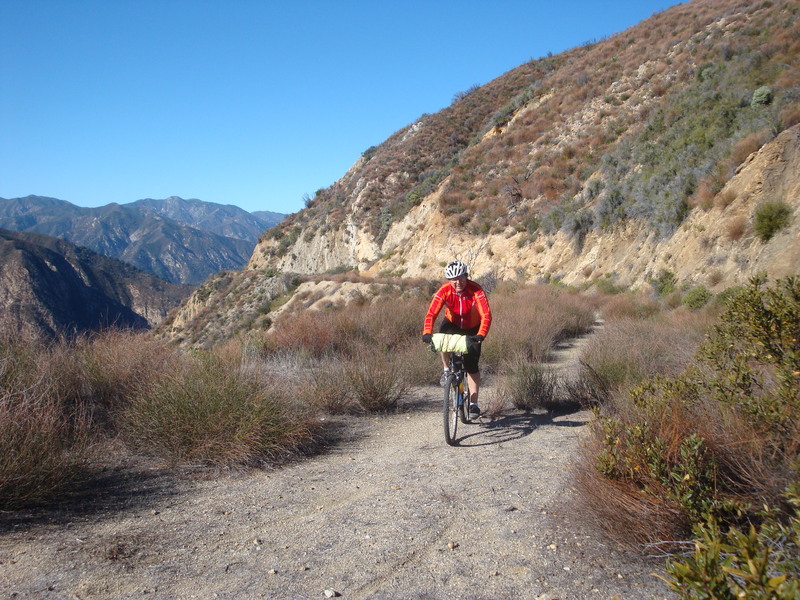 Arroyo Seco Campground to Escondido Camp is 15.5 miles. It is not a technically challenging ride and a mountain bike isn’t even required – just a wide enough tire to work on dirt. 38 is more than wide enough. Unless the December rains caused some new problems, there is only one spot that bikes need to be walked over. Gonna vacation out there this summer, that ride is ohn my list. Thanks for the write up. Hello There, thanks for the post!! There is a lot of good information and great pictures. I’m getting into bike packing and this seems like a good place to do a overnight test trip. Are there places to camp along the trail? (i.e.Hanging Valley Camp ) Any restrictions? I plan to park at the main campground and ride until I find a good place to camp. Recommendations are welcome… Thanks again posting the information, very inspiring!! Unfortunately, due to the ongoing Soberanes Fire, the Arroyo Seco – Indians Rd. 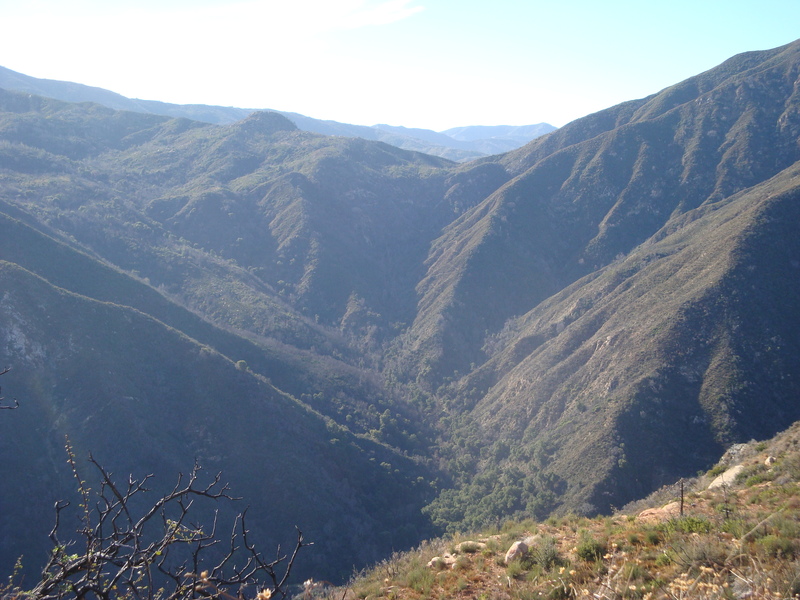 is currently closed to entry, along with the entire Monterey Ranger District of Los Padres National Forest. The road is, in fact, being used as a fire line. It will likely remain closed until some time next spring. Horse traffic is common on the Arroyo Seco-Indians Rd. I’m not much of a packer, but I’ve helped lead a string of mules and horses over the road and on up Willow Creek in the past. The Horsebridge trailhead didn’t get its name for nothing.